Born and raised in Jersey City, NJ; he was the third son of Pastor W.Wilson and Evangelist Lois Wilson. Several influential family members that preached the Gospel fostered his biblical foundation. Willingly accepting the call to ministry: He allowed biblical truths to lead and guide him. 1 Timothy 4:12 "Let no one despise your youth, be an example to the believers in the word, in conduct, in love, in spirit, in faith and in purity". He became the youngest Pastor in the state of New Jersey, and he also served as Pastor of the Union Baptist Church of South River, New Jersey for ten years. 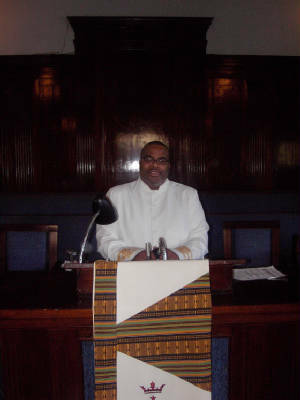 While preaching and teaching the word of God, He attended Rutgers University in New Brunswick, and the Rankins Theological Seminary in Newark. He is currently seeking his degree in Biblical Theology and Christian Psychology at the Philadelphia Bible College on Liberty Corners, New Jersey Campus. Being obedient to the will of God and having a life's commitment of devotion, he accepted the call and returned to the church in which he grew up to become the Pastor of the Mount Calvary Baptist Church. It was with great honor that he became predecessor to his father, who Pastored Mount Calvary Baptist Church for over twenty years before retiring. On September 28, 2002 he married Tamica Chisolm. As Shepherd, Pastor, Preacher, and Teacher; He instills sound doctrine and spiritual principles of a vision that "By Preaching Christ, Teaching The Saved And Reaching The Lost, Will Impact The Church to Manifest the Mission of the Church and as a result we will develop a Holistic Relationship with Jesus Christ".